Rate this Article Developed as a side project by 2 of our reviewers, it was a very proud moment for us when Icy Run won the title of “Best Indie Mobile Game for 2015”. With technology being an essential part of our everyday lives, having the skills to code is something that is highly valued in today’s society, especially (and obviously) if you’re in the field of technology itself! Thus, although PiKoYa Ltd, the company behind this website, is not exactly a game-developing company, 2 of our people have gone the extra mile and went ahead to develop plus publish our very first casual game, Icy Run! What comes as a side project took over the center of the stage when Icy Run has nabbed the title of “Best Indie Mobile Game for 2015” in the 8th GameIS Digital Games Contest. Now, if you’re not from Israel, you may not be familiar with the organizer of the games contest, GameIS. Well, please allow me to enlighten you in this matter. GameIS is the official non-profit association for the digital games industry in Israel. Established back in 2008, the organization was born from the ashes (so to speak) of the ill-fated International Game Developer's Association (IGDA) in Israel with the sole purpose of nurturing the video game industry in the country. One of the ways the association uses to achieve its objective is by organizing its annual games contest, whereby unique and high-quality games developed by local companies or individuals are recognized and awarded by the organization itself. The judging process, which includes important criteria like gameplay, graphics, sound, originality and innovation, as well as pleasure and value added, can be pretty strict, but this means that only the best can win... and apparently, the judges agreed with us that Icy Run is the best among the lot! For those of you who are scratching your heads in wonder at the words that was repeated quite a lot of times in this articles so far, “Icy Run”, well, do please allow me to introduce this amazing game to you all! 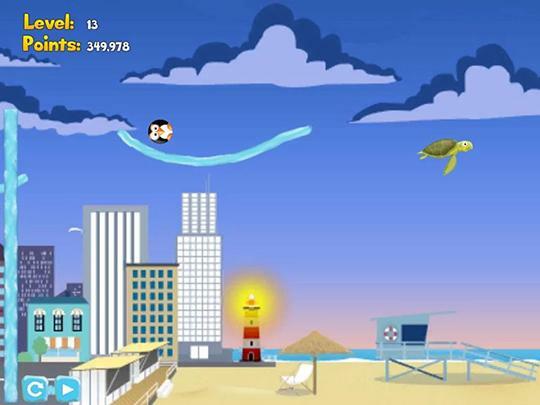 Icy Run is a casual game about Icy, a poor yet adventurous penguin who is trapped on dry land. In this game, you’ll need to help him go back home. How you can help him return to the South Pole? Well, it’s simple really – by using your mouse or your finger (depending on which device you’re playing the game with), you’ll need to use your power of frost to freeze paths of ice that Icy can then use to slide forward. Although your icy force is rather limited, it does make you feel a lot like being Elsa, the queen in the highly popular movie, Frozen. However, there are many dangers in the air as well as on the ground. As you try to keep Icy from falling onto the hard and dry earth, you’ll also need to keep him away from dangers like turtles that will slow him down and sharks that will swallow Icy in a single big gulp! Of course, you’ll be given some help along the way, such as the friendly dolphins as well as icy treats to keep your icy force topped up. In addition, there are many beautiful landscapes that you can explore as you help Icy survive dry land as well. I know the game sounds incredibly fun and that you can’t wait to try it out. Well, don’t let me keep you, and here’s a helpful link to the Browser version of Icy Run. If you're on your Android device, you might want the Android version of Icy Run instead. Lastly, don’t forget to rate the game!